collect some bikes from those years. I've now got hold of a Gitane Profile Aero from 1980. Stephen Hodges, and it is stamped. 10 07 80 and a 6.
catalog of 1980, the image and the text says EX equipment. welcome to the site . very nice collection . its hard to tell on the dates . we havent been able to decipher them with much luck. the first catalog we see the profile in is 80 . we are missing 1981 but it appears in the 1982 catalog also . so my guess is at least three years of production . nicolas a forum member here, found this pic while researching . I have had some contact with Emile Arbes who has the blog http://velosvintage.over-blog.com and is the brother of Hubert Arbes who rode with Hinault between 75-82. His Gitane Areo team bike found at this adress http://www.reneherse.com/gitanearbes. I do not know from which year though. Note the regular seat post bolt and "right" facing front brake. Completely with Campagnolo equipment. someone offered that bike for sale a year or two back . 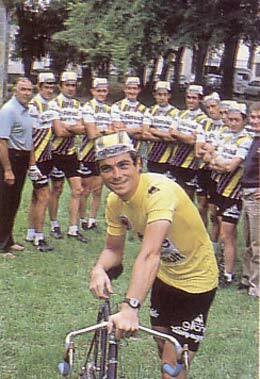 im sure all the actual team bikes were campy as they were the sponser of the team . may have had the mavic hubs tho . Looks like Campagnolo Record rear hub and Mavic front hub. The link in the last post does not seem to work, so you must get on the site www.reneherse.com and locate Gitane Profile. To see all the pictures. yup , i can see that they probably would have used a campy rear as campy was supporting the team. to my knowledge mavic was the only one at the time to have a 80mm front hub. and that was because of the wind tunnel testing and development at renault and mavic helping gitane . my profile has both hubs that are mavic with bladed spokes. i have the track version of the profile and mavic made a special stem and hanger for the belleri bars . ive never been able to track one down or get a answer from mavic about it . it looks like a bmx stem. and the pic in the 80 catalog is not very good. also the team bikes have a clamp bolt for the seat post instead of the allen set screw on the rear of the tube . my delta has the clamp bolt. oh and in case your wondering the seat post is campy too. The front brake mounting seemed to be by the whim of the mechanic: I have seen pics of Hinault with them mounted behind and in front of the fork. French news from 1979. Get past first part and see Profile presented at Paris Show? Anyway date is june 1979.
trust me, the brake mounted behind makes sharp turns left a nightmare. looks cool , but on a technical course I can see the front mount working way better. True, I thought the brakes were assembled incorrectly when I mounted it behind the fork and tried to turn the handlebars to the left, and it hit the down tube. Maybe it works better with Campagnolo Record brakes instead.